EW's Nisha Gopalan runs a few questions past The Spirit writer/director Frank Miller and producer Deborah Del Prete. Some juicy little bits are revealed about the upcoming film. Read the article here. Continue reading CBR: The Spirit Movie panel with Miller and Mendes. 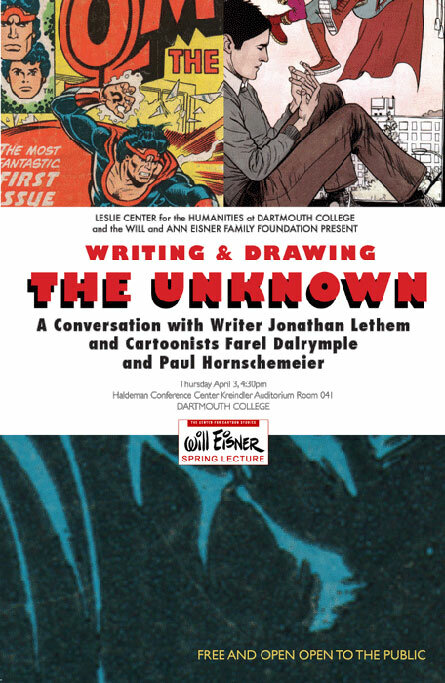 VCU Libraries is honored to present these rare examples of the incomparable art work of the late Will Eisner. 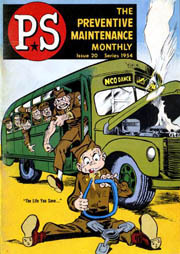 In an effort to encourage soldiers to keep better care of their equipment, the US Army hired Eisner's American Visuals Corporation to do a digest-sized publication focusing on preventive maintenance. Each issue consisted of a color comic book style cover; eight pages of four color comic continuity story in the middle; and a wealth of technical, safety, and policy information printed in two color. Eisner drew and was artistic editor for PS Magazine from its inception in 1951 until 1972. Presented here are complete scans for 145 regular issues, 3 special issues, and 14 index issues. Cindy Jackson is Archival Assistant for Comic Arts & Digital Collections in the Special Collections & Archives Department of the James Branch Cabell (rhymes with rabble) Library at Virginia Commonwealth University in Richmond, Virginia. Paul Fitzgerald is a retired journalist who spent 10 years at PS Magazine where he worked alongside Will Eisner and formed a life-long friendship. Paul's first book, Will Eisner and PS Magazine, will be published in May 2008. Stuart Henderson joined the PS staff in August of 1993, and he has been production manager of the magazine since March of 2002. He is also the Army magazine's unofficial historian. You can listen to this interview here! Continue reading The Spirit movie Poster. 2008 Eisner Award Nominees announced! Darwyn Cooke's The Spirit, from DC Comics, has been nominated in the 'Best Continuing Series' category. Continue reading 2008 Eisner Award Nominees announced!. On behalf of Lionsgate, we are pleased to present the first, finished production stills from the set of the upcoming classic action-adventure-romance, THE SPIRIT, told by genre-twister FRANK MILLER. Top is Samuel Jackson as The Spirit's arch-enemy, the OCTOPUS and below that, Scarlett Johansson as SILKEN FLOSS, a punk secretary and frigid vixen! The official Lionsgate movie site has been redesigned to feature a new graphic design and an iconic image of The Spirit as played by Gabriel Macht. The site offers the above widget, with a countdown clock to the first movie trailer. 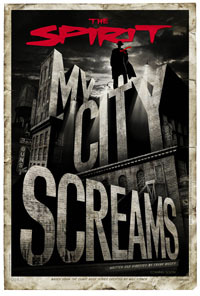 Plus a new Spirit Movie-related site: MyCityScreams.com is in the works.